Very kind, well balanced mare with a delicate mouth and classy expression. 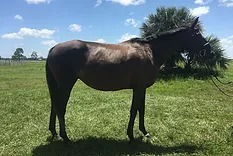 She has three lovely gaits and will require a soft handed rider with some education to build her confidence. She is very quiet to ride and handle but has a bit of a spook when nervous. Sound and best suited to an advanced rider but would be very rewarding for an intermediate equestrian with a trainer as well.